Workers clean up oil patches and tar this week in Orange Beach, Alabama. Most of Florida's beaches have not been affected by the oil disaster, according to Visit Florida, the state's tourism corporation. The state has not closed any beaches. "Florida's 825 miles of beaches, 1,260 miles of coastline and 14 seaports, including cruise ships, remain open for business," the site said. The Emerald Coast area, which includes Destin, Fort Walton Beach and Okaloosa Island, is urging travelers to visit. "Our white-sand beaches remain open and our emerald-green waters remain clear. In addition, offshore fishing is still going strong, with captains simply taking a more easterly course and reporting great success out on the water," the Emerald Coast Convention and Visitors Bureau's website said. Destin Mayor Sarah "Sam" Seevers told CNN a few, small tar balls came ashore this week but added that spotting occasional tar balls on the beach there is not unusual. The National Park Service reported heavier oiling at Perdido Key earlier in the week. The area is part of the Florida portion of Gulf Islands National Seashore. All of the Gulf Islands National Seashore sites, which are located in Florida and Mississippi, are open, the park service's website said. 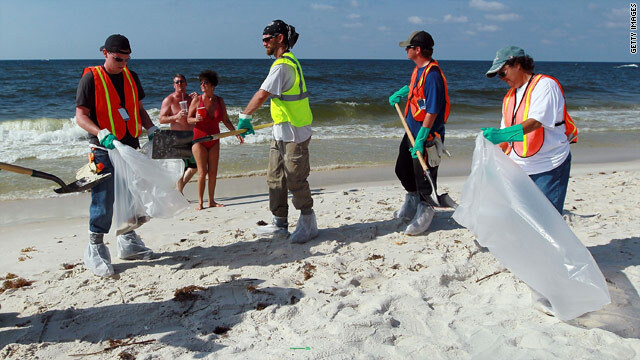 More than 140 people participated in cleanup on Perdido Key, according to the park service. Undetonated military ordinance was found onshore during the cleanup, the service's website said. A naval explosives disposal team reportedly detonated the shell. Crews of 40 participated in cleanup of light oiling at Fort Pickens and Navarre Beach, the park service's site said. The visitors bureau urges beachgoers to take precautions. "According to [the National Oceanic and Atmospheric Administration], tar balls do not pose a health risk to the average person, but visitors are advised not to pick them up." BP has purchased 10 additional beach-raking machines for more efficient cleanup at the urging of officials in Gulf Shores and Orange Beach, the Alabama Gulf Coast Convention and Visitors Bureau website said. The Alabama Department of Public Health has extended an advisory against swimming in waters off Gulf Shores, Orange Beach and Fort Morgan or in bay waters close to Fort Morgan, Bayou St. John, Terry Cove, Cotton Bayou or Old River. The beaches remain open. Perdido Pass, the main water access point to the town of Orange Beach, is closed to recreational boats for incoming tides. Boats may navigate the pass during outgoing tides, the visitors bureau site said. The pier at Gulf State Park in Gulf Shores is closed to fishing but open for sightseeing, according to the visitors bureau.